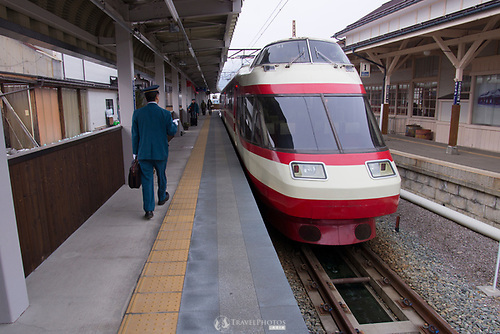 Japan has a lot of quirky things that are just totally unexpected, or cannot be witnessed anywhere else in the world. For this reason alone, Japan must be on every traveller’s bucket list. 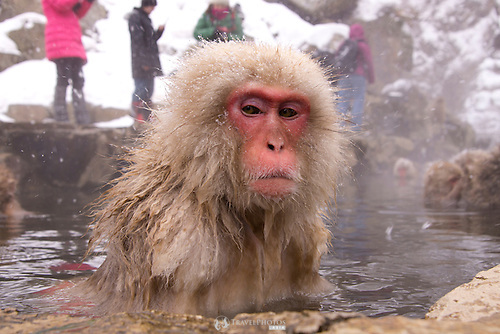 Among the must see things in Japan are the wild, untamed, untrained, self-motivated Japanese macaques taking nice warm baths in the winter snow and cold. Photo taken in 2014, before a barrier blocking access to this part of the hot spring bath. The most iconic place to see this is near the town called Yudanaka, in Nagano Prefecture. 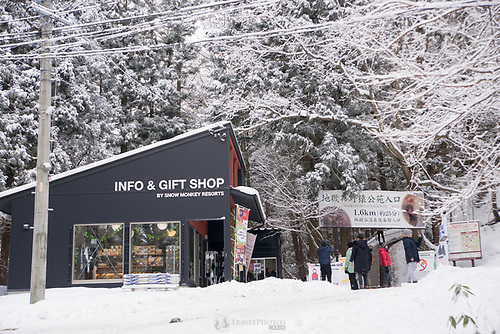 It’s a place known for it’s hot spring-public baths, and hot spring resort hotels. We stayed in one of the many resort hotels at the town, near the train station. 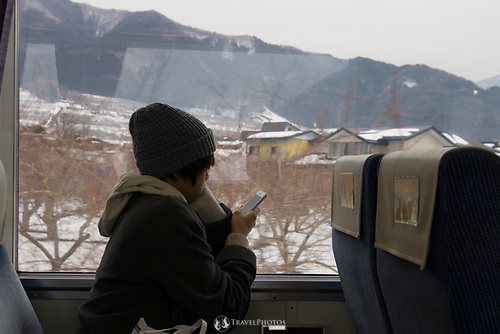 Firstly by train, you can take a bullet train to Nagano city from almost any major city in Japan. Then take a local train to Yudanaka. Check into your hotel, and I recommend that you walk around town a little. 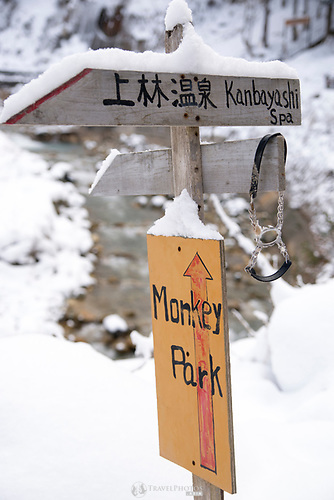 You’ll find some bilingual signs that point you in the direction of the monkey park. The next morning, wake up as early as you can, and follow these signs up to the Monkey Park. It takes about an hour to walk from the township to where the monkeys are. 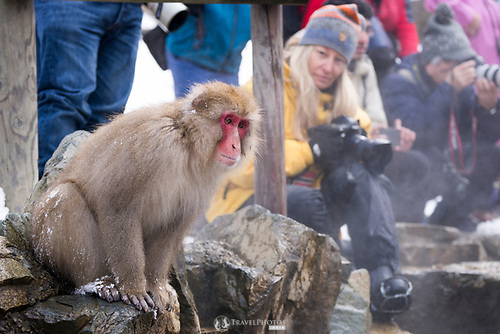 There are buses from the township to the Monkey Park Entrance area. Secondly by car, you can easily book and rent a car from Toyota Rental Japan on their English language website. We rented a small Toyota Vitz compact car; a four-wheel drive/SUV is not necessary. On my second trip there, we rented a car, as it would be cheaper than the three of us paying for train tickets. Make sure you get full insurance, snow tires, and an ETC device (and card if you don’t already have one). You’ll be taking toll ways most of the way. You can borrow an ETC card that automatically pays the tolls for you, allowing easy passage; you will of course have to reimburse the card owner/supplier. However, we almost had a crash because of the ETC toll system. The final toll into Yudanaka does not use ETC, but requires an actual ¥100 coin. As we approached the barrier, I slowed the car, but didn’t hear the electronic beep to confirm a payment/connection. I slowed a little more, but when the barrier failed to rise I had to slam on the brakes. My friends and I lost years off of our life expectancies. After a closer inspection of the unmanned toll booth we realised actual money was needed, and a quick scramble we found a ¥100 coin and were in. 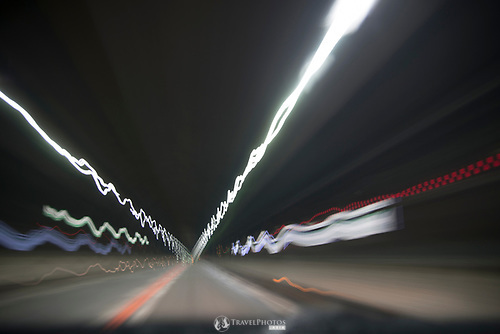 If going by car, you’ll pass literally through some mountains, and some of the longest tunnels you’ll experience in your life. I think the longest we went through was perhaps 11km! This makes for a game of guessing how long the next one is; the winner has dinner paid for them. Thanks to @godwhale (Instagram) for taking this for me, while I was driving. 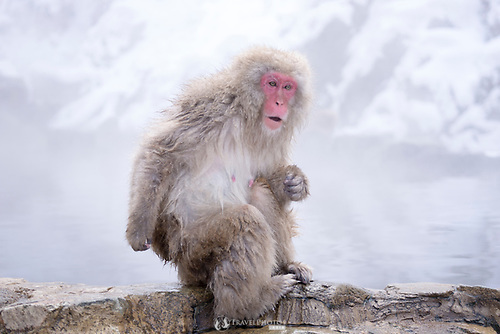 The actual place is called Jigokudani Monkey Park (in English). There are only two ways that we know of, one is by public bus, and foot (it’s a 1hr 25min walk from Yudanaka Station). In both cases, perhaps the most stress-free way to move about in Japan is to use Google Maps. Please rent a portable WiFi device (now easily available from some AirBnB hosts, and WiFi rental companies), and connect your smart phone or iPad to it. When travelling with friends, we’ve never had a problem or argument when following Google Maps. All your batteries should be fully charged in the morning (think also smart devices, camera batteries, everything), as the cold tends to run them down quickly. Keep your portable WiFi in an inside jacket pocket, so your body heat can help keep it warm and keep the batteries good for the whole day. It is possible to walk or drive up to the park entrance. Once in, the walk is mostly flat, and very picturesque. 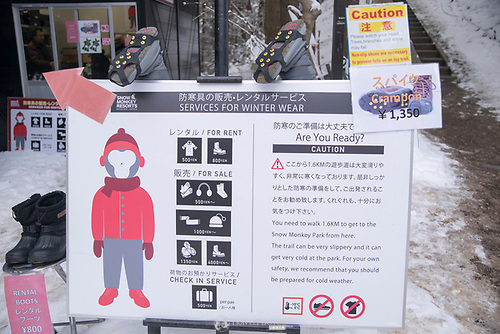 At the entrance you will see big signage telling you you must have certain safety gear, which I recommend anyway, and they rent and sell for people who forgot or didn’t know. 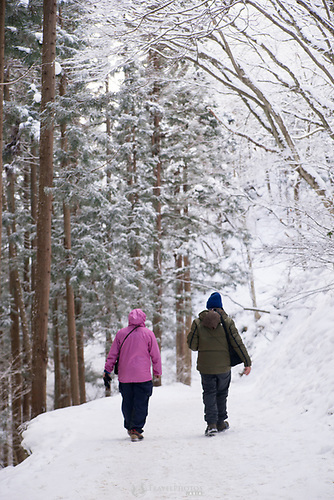 Make sure you have gloves, sturdy water-repellent footwear, and special grippy-things (crampons) for walking on ice. On my first trip there, my boots caused such blisters and agony, that I went back to my hotel, put on my regular shoes with the grippy-things, and had zero problem. However, because of the cold and risk of twisting your ankle on uneven ground hidden by snow, I’d still recommend snow boots or hiking boots. There are more warning signs. Don’t take in open or unpackaged food. The monkeys will smell it and attack for it. They also don’t want you giving monkeys human food. Also, never look a monkey in the eye; they will perceive it as a threat and a challenge. There are other warnings, but these are the main ones. There are lockers there that you can use to store your food and other valuables in. Also there’s a ticket office that charges for entry. 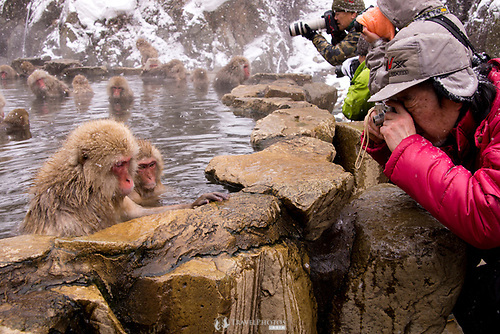 Once you’re in, don’t be rude or pushy; everyone there just wants to relax and enjoy the spectacle of the monkey culture. The monkeys seem to be on edge, always aware of what other monkeys are doing, and they seem to be alert for sudden tensions. 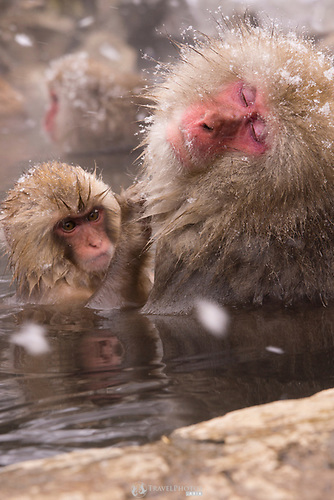 Once a certain monkey enters the bath, other ones immediately leave; it seems like there are monkey factions. If you can figure it out, let me know. 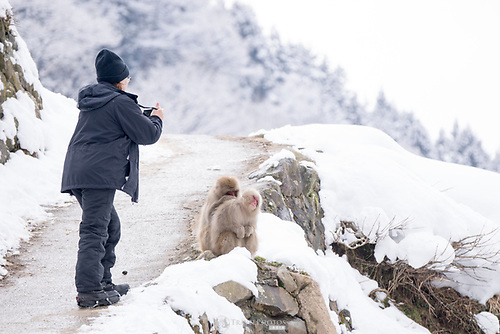 For the most part, the monkeys are oblivious to the human tourists. If you or your camera get too close, they will push you out of the way; not rudely, but in the same way you’d open and close a door. There are two ways to photograph this place. One is to take a few photos, and leave; like many regular tourists. The other is to stay as long as you can (may be an hour or so, at least), and really get to understand the monkeys, how they move, what they do, and so you can predict their movements, so you can take better photos. You’ve spent a lot of time, effort, and money to get there, so why not leave with a huge cache of photos, of which you would be guaranteed a handful of great ones. Make sure you take a telephoto lens. On my first trip, I used mostly a wide lens, because we were allowed to be right up at the edge of the bath, but not anymore. You’ll be behind a barrier, so you’ll need a long lens to zoom in and isolate your subject; I’d recommend a 70-300mm lens, with a hood. The hood should help keep the snow off the front element. The kind of cameras you see there are as astounding as the wildlife. There are lunch opportunities there. Within a hundred meters of the monkey hot spring ticket office is a Japanese style hostel, so you can wake up and be the first photographing at the hot spring in your pyjamas, if you insist. However, anyone can dine for lunch there. There’s also a souvenir shop at the ticket office with very limited food options. However, the best places to eat are back at the park entrance near the bus stop and car park. Be there before 11.30am to be sure of a seat. Otherwise, pack a bunch of snacks and have those on the trail back to the park entrance as you leave, before having a warm bite back at the township. Book your hotel early. Most of them fill up in the month before you plan to go. Most hotels are Japanese style resort hotels, which means they’ll have their own hot springs, luxury Japanese style menu options (which are often not to my liking). The rooms will be simple tatami types, which means you’ll have basic mattresses on the floor. The rooms are warm. The first hotel I stayed in had small seats, but the second didn’t. So, when my friends and I played a card game, it was a bit taxing on the back to be sitting without a backrest. 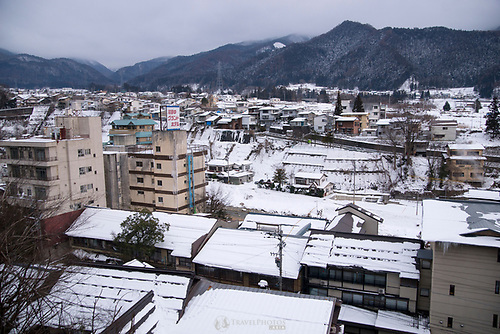 A view of Yudanaka township from my hotel window. There aren’t many options, but fortunately there are two good points. Firstly, most restaurants are quite ok. Secondly, there are restaurants near the hotel part of town. There are many hotels, and they seem to be clumped together near the train station. Your hotel will have its own dinner menu, but probably not to your liking. The breakfast menu will not please you with its range of salads and lunch meats, but it will still be edible; you won’t go hungry. 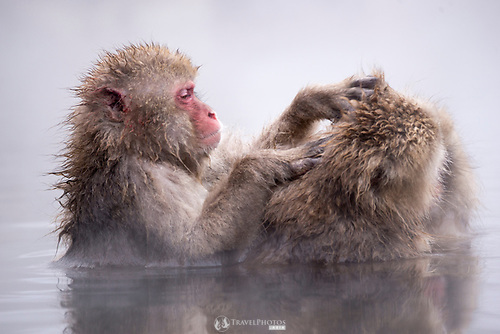 For these images and lots more, see the Yudanaka gallery in my portfolio.